Jetpack Jr. in print! Who’da thunk it? Marc and Rachel at The Sunday Comics have a simple idea: bring back the Sunday Funnies! 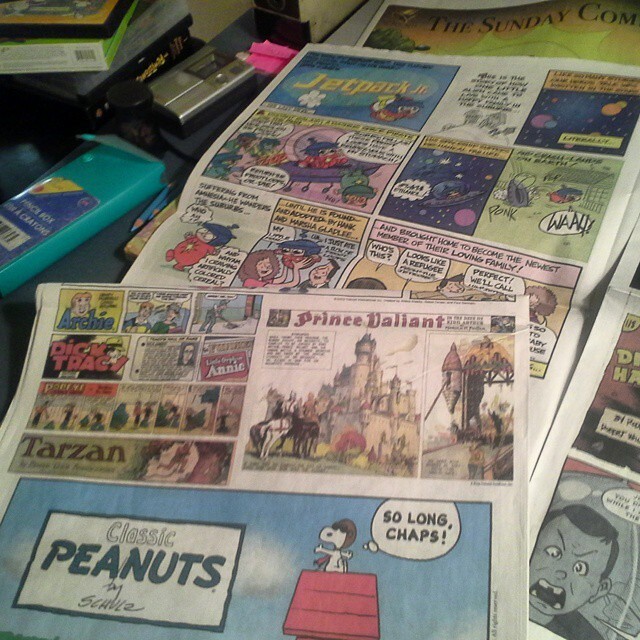 It’s no news today’s newspapers are missing something–Sunday comics sections aren’t what they used to be( all ads and few comics)–and newspaper readers are missing out. Is it a surprise newspaper sales are down? Put together a big, overstuffed package featuring as many of the great new comics out there as you can fit, plus some of the old-and you’ll have a package people will love. Kevin Mutch and I had a similar idea when we printed “pood” a few years back–our short-lived tabloid comics newspaper. 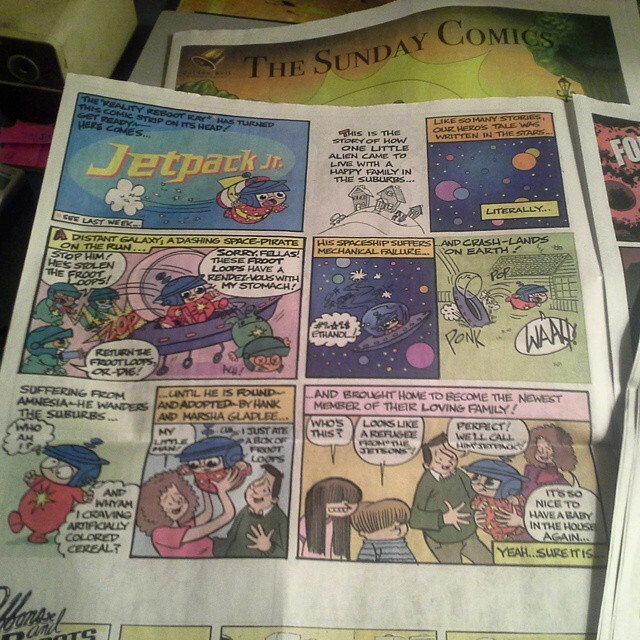 But “The Sunday Comics” has gone us ten times better by bringing together venerable syndicated comics like “Dennis the Menace” and “Garfield” with newer comics like “Jetpack Jr.” and “Pirate Mike“, upping the page count and printing full color all the way. What you see in the photos is the promo preview; the real deal should be out sometime in 2016–and it’s gonna be a smash! While I’ve been publishing Jetpack Jr. online in one form or another since 2011, I have to say, there’s still nothing like the charge of seeing your work in print. I don’t think it’s my solely my age that predisposes me to paper–Marc and Rachel are in their twenties! E-books have not replaced hard copies( far from it! ), magazine racks are overstuffed and despite all of the talk around the subject, and yes, the serious decline in circulation, newspapers are still on newsprint. Holding the comic in your hands makes it real, tangible. It’s a connection to all of the great comic strips, characters and creators we’ve come to love throughout the history of newsprint. I’m hopeful–but not expectant–this will be the first of many times Jetpack Jr. is in print on paper. Other than Jetpack Jr., my online presence has dwindled to next to nothing these past few months. Between my job, the comic strip, traveling back and forth to work( 200 miles each way), the house, helping the missus with her craft shows-it’s hard to find time to write for my blog. My Twitter and Tumblr accounts lay idle and I barely have time to keep up with friends on FB. Despite my negligence, subscriptions to Jetpack on GoComics.com have risen– a little bit ahead of the pace when I spent all that time working on Gifs, tweeting and tumbling! Go figure. I’ll be on sabbatical in 2016,and I have some exciting projects in mind for Jetpack Jr.! More about that later–in the meantime, it’s off to another craft show this weekend, selling Deb’s hats in the town of Clinton, NY–home of Hamilton College and Colgate University! I’ll be the guy behind the booth drawing the next series of Jetpack Jr comics! I’ll say “so long” for now–and in honor of my Dad and his bad jokes–see ya’ round if you’re a doughnut! ← "Jetpack Jr." returns October 1st!